The Festival of Fantasy parade performed at Magic Kingdom Park is typically offered at 3 PM each day. We have learned that the popular parade will be moved to a 2 PM time slot for a lengthy period of time. This change is expected to begin on August 17th, 2018 and will last throughout the holiday season. It will run through the dates when ticketed events like Mickey’s Not-So-Scary Halloween Party and Mickey’s Very Merry Christmas Party are offered. It makes sense to move the time of the parade up given that the park will close earlier than usual during the ticketed events. Disney has tested this time change in the past, so it isn’t surprising that this change would be offered. At this time Festival of Fantasy is expected to return to the normal 3 PM time slot after the season of tickets party events are over. Festival of Fantasy is one of the only parades left at Walt Disney World. There used to be parades offered at the other theme parks as well as a nighttime parade at Magic Kingdom Park in addition to Festival of Fantasy. These other parades have since been discontinued with parks occasionally offering parades for special events. The Festival of Fantasy parade is extremely popular, so guests will definitely want to be mindful of this time change. 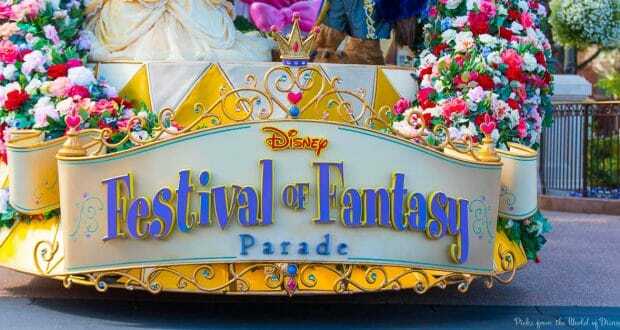 How many of you make sure to catch the Festival of Fantasy parade when you visit Magic Kingdom?